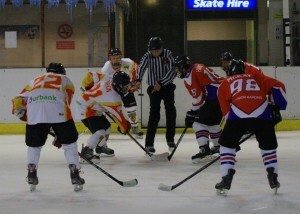 The Bulldogs were back in action on Sunday against the Nottingham Cougars. The first period was a tightly fought affair with the Bulldogs constantly putting the Nottingham team under pressure, the work rate from the Bulldogs was absolutely fantastic considering the majority of players had played an under 18’s game the day before. The period ended 1-1 with Kieran Brown scoring for Bradford. The second period continued as the first, with both teams passing the puck. The Cougars picked up the pace and went close on a number of occasions but Bradford were always looking dangerous on the break. The game was none stop and end to end but Bulldogs were finding hard to keep the intensity of their play at such a high level. Nottingham made the most of their chances whereas Bradford kept finding a post as the last line of defence. The period finally ended with the Cougars leading the game 5-1. The third period started with the Bulldogs finding an unbelievable amount of fight and desire, coming out of the blocks hard and fast and dominating the puck but they just couldn’t find that much needed early goal. The Bulldogs were always looking dangerous and after some fantastic player Kieran Brown found that much deserved second goal, both teams were fighting for the puck and both net minders were kept busy. Then late in the game a fantastic pass from defence man Lewis Baldwin found Kieran Brown in centre ice and the little maestro skated through one on one with the net minder and finished in style. The Bulldogs went down 6-3 but the effort and desire from the Bulldogs was outstanding. This was an exciting game of hockey played between two teams playing hard but fair. Well done to Bradford and Nottingham for putting on a fabulous show. 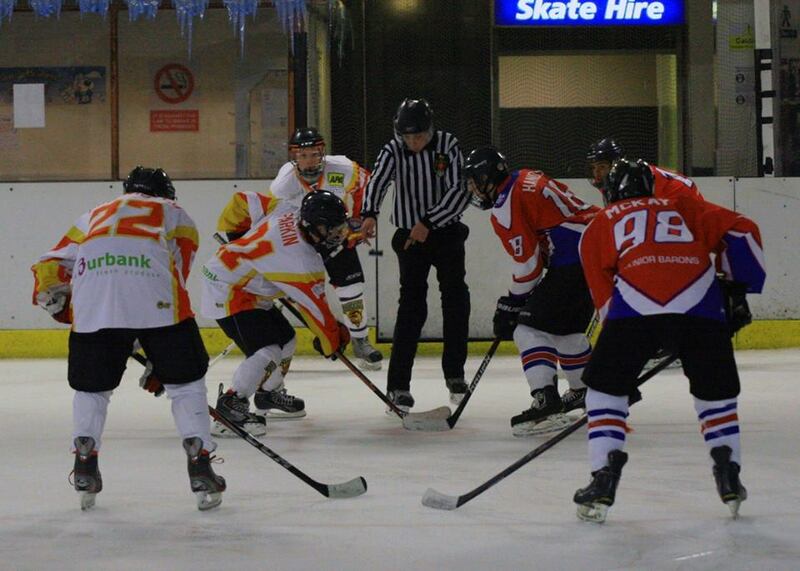 On Saturday 14th December 2013, at Bradford Ice Arena the Bigdog U18 Bulldogs faced Solihull Barons. The away game at Solihull had been a tough challenge for the Bulldogs, but we got the win, so were again looking for the home win in our own barn. The first period started with strong attack from the Bulldogs, and the Barons were also doing their best to keep the puck, at just 2:16 a feisty Baron, Kennedy Wallace, well known for her obstructions received a 2 minute interference penalty. The penalties continued for the Barons and at 6:09 Jordan Bird was sent to sit for 2 minutes for holding. This was followed by Jay Fagan trying to get his own back and also received 2 minutes at 6:34 for boarding. In the same minute while both teams were 4 on 4, Adam Barnes took his opportunity and scored goal number 1 for the Bulldogs at 9:46 assisted by James Royds. At 13:12 Solihull were beginning to feel intimidated and Joseph Gilbert sat for 2 minutes for slashing. Again the Bulldogs had the advantage of 5 on 4 and Ryan Kemp found the back of the net at 13:24 assisted by Lewis Baldwin. The Barons back to full strength brought the two teams back to end to end hockey, but at 14:36 Jay again kept the penalty bench warm as he was there again for tripping. Back to full strength and the Bulldogs kept up the pressure and again at 18:33 Ryan again tipped the puck into the net assisted by Adam and James. Score now 3 0 to the Bulldogs. Nineteen seconds after the whistle blew it was Connor Parkins turn to score assisted by Adam and Josh Birtwistle at 18:52. At 19:36 a feisty Niks Veiss sat for 2 minutes after a roughing penalty. End of period score 4 0 to the Bulldogs. The second period started as the first one had finished with a score a short handed goal from the Bulldogs from Captain Connor Parkin at 20:30 at 20:58 Liam was then sat for 2 minutes for cross checking. But then at 21:25 Solihull assistant captain Cody-Leigh Tookey scored the first Solihull goal, unassisted. At 21:34 it was Adams turn to dodge the Solihull net minder and score another shorthanded goal to bring the score to 6 1. At 21:53 a boarding check from Adam Hands, and a roughing check for Joseph Gilbert, followed by 2 misconduct penalties towards the reff saw Gilbert exit the game. At 22:01 Ryan got his hattrick goal again short handed assisted by James. Six seconds later at 22:17 Adam scored his hattrick goal. This seemed to upset the two Solihull girls, Wallace and Tookey then decided to goad and intimidate an already riled Liam Kirtons hot headed patience, and a few chosen words from them saw him also receive a 2 x 10 minute roughing penalty at 33:58 for trying to fight the girls and Solihulls , Captain Lewis Tooth who also received two ten minutes and left the game for the dressing room. The girls seemed to cause it all but didn’t receive any penalty. This seemed to change the dynamics of the Bulldogs game, because at 38:41 again Tookey got another goal for Solihull – end of period score 8 – 2 to the Bulldogs. The period was ended at 38:58 allowing everyone to calm down. At the beginning of the third (40:54) Niks received a 2 minute penalty for unsportsman like behaviour and at 43:51 Baron Tookey sat a tripping penalty whilst Bulldog Josh B sat 2 minutes for holding. At 50:00 the Bulldogs changed their net minder and U16 Brad Cartwright had his debut for the U18’s. At 50:10 Baron Adam Hands received a 2 minutes for slashing, once back on the ice Hands took no time to get to the net and score a third goal for the Barons unassisted at 53:28. The remainder of the game was clean uneventfull (!!) hockey, Brad taking 11 shots , Andy taking 30 in the game. Final score was 8 – 3 to the Bulldogs, MOM went to Jay Fagan. Well played once again team! On Sunday 8th December the U18 Bulldogs travelled to Sheffield to face the U18 Sutton Sting on pad 2. The game started strongly with end to end hockey and a number of shots saved by Andy Button. At 6:12 Sutton were the first to get the puck in the net an even handed goal scored by Suttons assistant captain, Harry Bridges. This was shortly followed by an equalizer from the Bulldogs, scored by Ryan Kemp, assisted by Adam Barnes and Hannah Gibson. At 10:04 Sutton’s Captain Lawson Glasby sat two minutes for stick holding, which gave the Bulldogs a chance to score on the power play, unfortunately Sutton held close and Danny Spence also found himself on the penalty bench for slashing at 12:58. Next it was Suttons turn for the penalty as Dominic Clark was sat for hooking, in the last few minutes of the period, a scuffle around the net saw the puck sitting just in front of the line, James Royds managed to neatly tuck it over the line, but the referee called no goal as there were Sutton players in the crease, it ended a 1 all period. Period 2 started, and after less than a minute Liam Kirton was on the penalty bench for ‘clipping’?? The Bulldogs kept the puck out of their net whilst shorthanded, as Liam emerged from the gate he picked up the puck and had a shot on target, but was saved. At 29:05, Sutton scored their second goal, an unassisted goal from Alex Manning, but fifty seconds later at 29:55 Ryan Kemp skilfully tips the puck over the netminders shoulder equalising the game to 2 all; assisted by Adam Barnes and Lewis Baldwin. At 30:55 Suttons Bridges was sent to the penalty bench for boarding Lewis Baldwin in a very aggressive check from behind. At 32:28 Sutton scored their third goal from number 55 George Cranshaw, and at 37:44 Liam sat a further 2 minutes for boarding. The end of period score was 3 – 2 to Sutton, Andy wasn’t very happy with this and gave the players a right good talking to!! In the final period Adam Barnes scored the opening goal, assisted by Ryan at 41:27, this was swiftly followed by an unassisted breakaway goal from Liam Kirton at 41:48; taking the score to 4 : 3 to the Bulldogs. At 44:55, following a handbags scuffle and a tiring Sutton team, they received a 2 minute bench penalty for too many men on the ice, and a ten minute misconduct penalty to Captain Lawson Glasby, the Bulldogs took advantage of this and Adam Barnes receives the puck from Ryan Kemp and tucks it swiftly into the top left hand corner of the net, bringing the score up to 5:3 to the Bulldogs. The team talk from Head Coach Andy had obviously made a difference! At 49:01 Liam receives a further 2 minutes for interference and at 49:55 Sutton’s George Crawshaw receives a 2 minute tripping penalty, Ryan was the next in the penalty bench at 54:05 for high sticks, swiftly followed before the bench was cold by Danny Spence at 56:59 for tripping, and closely followed by Cameron Kushnirenko at 59:44 for holding!! But the mighty Bulldogs held together and kept the score, finishing at 5:3 to the Bradford Bulldogs, well done team. Shots on goal to Andy Button was 18, and the well deserved MVP went to Ryan Kemp. A great game, great score and the much needed two points pushed us higher up the top of the table. Cracking result against a physically strong Telford side!